Field Day is tomorrow, Friday, June 16th! Volunteers please meet at the gym by 11:45 AM. Don’t forget to have your student wear sunscreen tomorrow! Fun @ the Sock Hop! The 3rd annual Sock Hop was lots of fun and raised approximately $4,000 for our sister school in Afghanistan. Thank you to John Hay students, parent volunteers and the Public Stewardship Committe for their time and efforts. This event would not be possible without the help of our extraordinary volunteers! They decorated and organized, cooked hotdogs, popped popcorn, painted faces, served food and drinks, ran the cupcake walk, played music, sold tickets and glow sticks, counted money and cleaned up – WOW! Stay tuned for more on our Journey with an Afghan School project. Robotics will be coming to John Hay in 2011-2012! I am happy to let you know that next year we will be bringing a new after school program to John Hay! It is a robotics program that Coe Elementary has titled Coebotics. This is an excellent program that Coe has been doing and that John Hay will be starting next year. Our school will have two teams in the fall, a FLL team which will be ages 9-14 and a jrFLL which will be for ages 6-9. If you think you might be interested in providing this opportunity for your student I would encourage you to attend an informational meeting tomorrow night at Coe Elementary. Please read below for more information on the meeting. If you have any questions please contact Sara Mirabueno at 252-2100. While there is little you need to do before school starts, there are some helpful things we have learned in the past two years, which if taken care of now, will allow you to hit the ground running in September and prepare for the competition season in WA State. So therefore, I’m glad to hold an informal meeting on Wednesday June 8th at 7:00 PM at the Coe Elementary School home of the CoeBotics teams and talk to you about how we are organized, what we have learned and answer any questions you may have. You should feel free to bring whom ever you like, other parents, teachers etc, other schools or organizations who may be interested in starting etc. Feel free to forward this open invitation to whomever it may help. Hope to see many of you, and looking forward to the next season! June has arrived! While we are still awaiting more sunshine, the energy level inside the building has definitely increased as students and staff eagerly prepare for the close of another wonderful school year. While you may be aware, our auction this year completed another cycle of funding that provides for a variety of core programs to serve and benefit our students. A couple of weeks ago, the Partner Board met to discuss and vote on which programs would be funded next year. The conversation, as always, revolved around prioritizing those programs that demonstrate the most tangible success for all students. Our reading support programs, an enhanced tutoring program that will now include tutoring at the kindergarten level, Pathways Enrichment for 4th and 5th grade, as well as various programs to support the learning community were approved with little to no change, and thus the continued commitment to providing innovative interventions and support of academic growth and achievement remains a high priority for our school and students. As our population has changed, and as we move toward other changes highlighted last month around bringing Drama and music under district-funded sources (see the May Hay News), the conversation turned to decisions around Art and Spanish. As you know, our Art program has been displaced from the art room due to our growing population. I am pleased to announce that we will continue to provide art classes to all students, K-5 with an Artist in Residence model. The program will provide art on a weekly to bi-weekly basis between October and May. Hay has implemented a program similar to this in the past with rave reviews and enormous success. Unfortunately, given the limits of time that can responsibly be devoted to supplemental programs, and the limits around available funds, there was a price to be paid. Our Spanish program will no longer be funded beginning next year. While a very difficult decision to make, the reasoning behind the choosing of art over Spanish provided by teachers to the Partner Board was helpful and important in the making of this decision. Some of the feedback from teachers includes evidence seen over the past couple of years that indicates if a child enters John Hay during the school year, or enters mid-way through his/her elementary experience, he/she has great difficulty connecting with Spanish instruction as there is no history of instruction upon which to scaffold. With art, the scaffold is not needed, as art meets every child where he or she is, and brings with it a strong opportunity for expression and a sense of personal success. We have been very proud to offer Spanish over the past few years. We have embraced the multi-cultural emphasis that our very capable Spanish teacher, Seniorita Monica has brought to our students. We value the critical thinking opportunities that learning a language can provide. And while we can no longer offer Spanish at Hay, we are committed to looking at other means by which we can model the value of a multi-cultural experience at school that works within our budgetary constraints. First, language courses will continue to be offered through our before and after school programs. And, the most popular idea amongst staff is to invest in an annual multi-cultural fair where individual students and families share and celebrate personal histories and cultural experiences. We envision a multi-cultural emphasis, school-wide, that celebrates our growing diversity and allows students to share traditions, foods, and histories special to their own unique family. Obviously, this worthwhile direction requires much less funding and will continue to allow us to prioritize an authentic multi-cultural experience for our students here at Hay. Look for more information around this idea to formulate in the months to come. Change is difficult. It shakes delicate balances and ushers in a sense of uncertainty as we move from the predictable to the new. But, change characterizes the season we are in as we continue to move with the transition of becoming a reference area school. Our first year is successfully behind us, and changes have been weathered with not just tolerance, but with excitement about what may come and how to innovatively and creatively think and plan in new and different ways. Even in light of changes, John Hay continues to be an amazing public school. It upholds the practices and principles known to be in place for the most highly effective schools, nation-wide. And it will continue to do so. Thus, we will pursue our mission with focus, clarity and wisdom around what we know as our first and most important role – to TEACH. …develop caring learners who are actively growing and achieving. As always, should you have questions please don’t hesitate to call on me. I am always happy to clarify and explain the decisions made that impact the Hay learning community. This past month we have been very busy at John Hay with many fun activities and it would not be possible without the help of many extra hands! Thank you to all who help make these events happen! Science Fair: The John Hay Science Fair, held on Thursday, May 26th, was a great success, attended by many families. There was high student participation at each grade level and the judges had a difficult time selecting winners as the projects were all creative and inspiring! Congratulations to all our John Hay scientists! Teacher Appreciation: Last week John Hay teachers were showered with gifts, cards, flowers, treats, lattes, a delicious breakfast and luncheon and chocolates. A heartfelt thank you to our students and families! Rummage Sale for Japan: Thank you to all who donated items, volunteered time and goodies to the Rummage Sale/Bake Sale on May 21st. It was a huge success and nearly $3000 was raised to benefit the people of Japan. 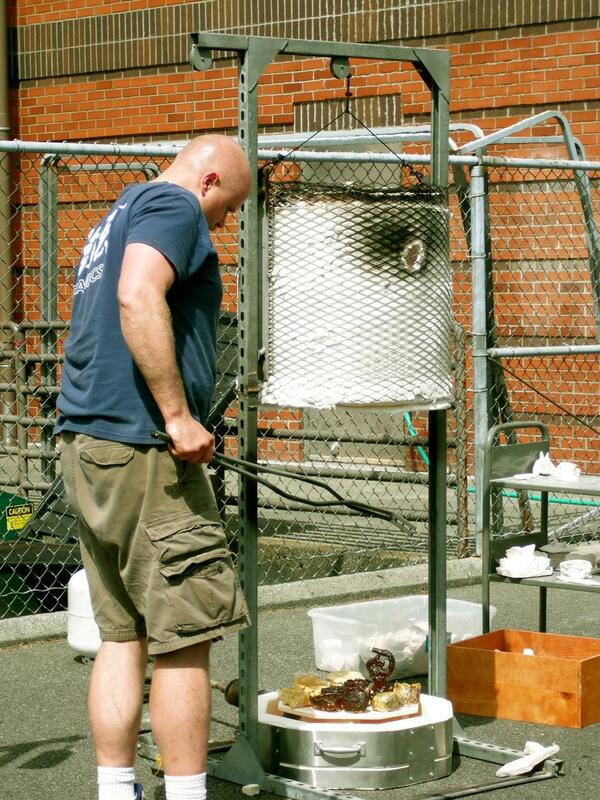 Raku Clay Firing: The firing was a huge success! Special thanks to Elizabeth Hudd and all the fabulous parent volunteers who were not afraid to get smokey! You should be seeing some amazing pottery pieces and sculptures coming home.